Vince Cook is a fine woodworker who strives to bring beautiful wood objects to your every day life; he makes unique cutting boards, salt and pepper shakers, and coasters from locally sourced wood. Chop Finely provides kitchen items that have a reverence to the materials they are made from, crafted with live edges and natural wood grain. Find something amazing for the chef in your life from Chop Finely! I’m Vince Cook, owner of Chop Finely. 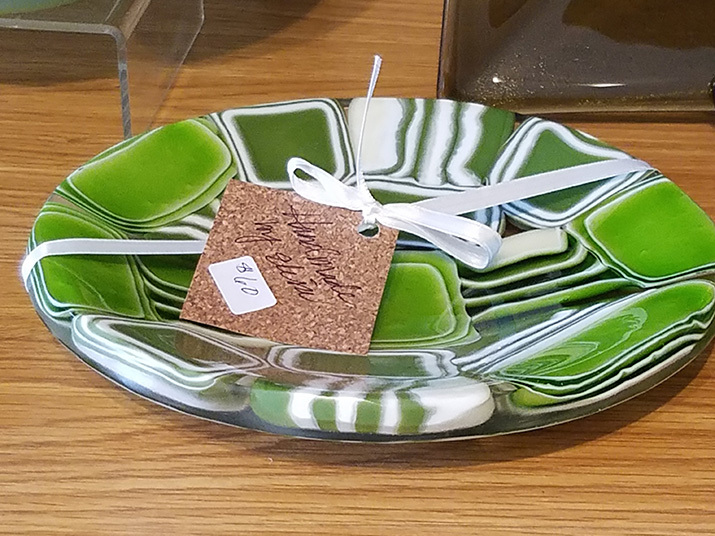 We create handcrafted wooden kitchenware including cutting and serving boards; large serving trays; salt and peppershakers and drink coasters. We are always creating new cutting board designs, but recently have been hand-carving dishes from black walnut logs. These are really fun as they incorporate the bark into their design and every single piece is unique. We often hear from our customers that they love the unique designs that we create and they appreciate that we use sustainably harvested or salvaged trees to make our products. I’ve been making things from wood, painting, and drawing since I was very young. I had my first commission at about age 14. I’m a professional furniture maker and started making wooden kitchenware as a way to fully utilize the workshop. It also allows me a creative outlet to try out new designs and building techniques. All of our designs are unique but we are one of the only makers incorporating live-edge (bark) into our serving trays. We also work with a local blacksmith to design unique hand forged iron handles for many of our pieces. Our business is in Brainerd, MN and it hosts one of the few remaining small forestry coops in the country. Through them, I am able to obtain many Minnesota hardwoods that provide the unique materials for our products. Chop Finely is a cooking term that we thought very appropriately fit with our first products – cutting boards. We created our first board and my 10 year-old daughter sketched it, and that became our logo. Check out more of Vince's work online, and be sure to stop by his booth at the Minneapolis Gift & Art Expo, November 3-5, 2017 at the Minneapolis Convention Center! Allison and Jonathan Metzger combined their love of printmaking and textiles to create Midnight Oil Studio & Workshop, a business where they can collaborate via silkscreen printing. Each print is made by hand, from the designing to the printing process. Although the silkscreen process for printing is often used on fabrics in only a few colors, Allison and Jonathan use the technique on paper with multiple layers of color. Stop by their booth or the demo area to view a demonstration of their process. We can't wait to get our hands on one of their limited edition prints! Midnight Oil Studio & Workshop is the artistic brainchild of Allison and Jonathan Metzger, collaborative couple. We met while we were in the fine art graduate program at the University of Kansas in Lawrence, KS. We both received our Masters Degrees of Fine Art in 2013, and we have been collaborating ever since. Midnight Oil Studio & Workshop creates limited edition fine art silkscreen prints with imagery of American landscapes and natural phenomena, contemporary pop culture and unique objects. Have you always been passionate about art? YES! We have both always been creators and dreamers; Jonathan loved comic strips as a kid, and recalls perfecting his own renditions of various Peanuts and Garfield characters throughout his childhood; Allison has always been drawn to textures and textiles and, as a kid, she loved creating crazy-quilt style collages and monoprints using various found and crafted objects. This desire to create beauty and share it with others is what drives us everyday to learn and improve our craft. What do you love most about show vending? The people! At every single show we have ever done, we have met the loveliest people. Vendors are always willing to lend each other a hand; we share extra blankets, umbrellas, and duct tape, and love to trade stories and tips. The customers are fun and wonderful to interact with, and we have often received some excellent advice on a direction to take a work in process, or a person to connect with to further our business. The shows are basically big parties, and everyone is having fun! Jonathan received his MFA* in Printmaking and Allison received her MFA* in Textiles; silkscreen printing is a technique that overlaps the two disciplines. We both love the modern, clean, and graphic look of silkscreen on paper, and we enjoy pushing the expectations and understanding of what is possible with the technique. Silkscreen printing is also one of the few printmaking techniques that doesn’t require large, heavy, and super expensive equipment; we actually built all of our studio equipment ourselves, and we work out of a spare bedroom in our home! *Master of Fine Arts is the terminal degree in this country for fine art. We love exploring and pushing the expectations of what is possible with silkscreen prints; most people are familiar with silkscreen as something that is used on tee-shirts or flat 2-3 color gig posters; we create complex imagery with up to 17 layers of multi-color rolls, textural details, and unique compositions. People who are familiar with the silkscreen process are often astounded when they realize that our work is all hand-drawn and hand-printed. We don’t use computers at all, and don’t have any digital copies - everything is hand done. The term “midnight oil” was first coined by an English author Francis Quarles, in 1635, but the phrase “burning the midnight oil” became popularized by Dolly Parton in 1972, in a song by that name. We love the fascinating enigma that is Dolly, and we strive to run our business so that we, like she, will simultaneously do well AND good. We believe art is for everyone, and we work hard-sometimes all night long- to make it accessible, beautiful, and fun; just like Dolly. 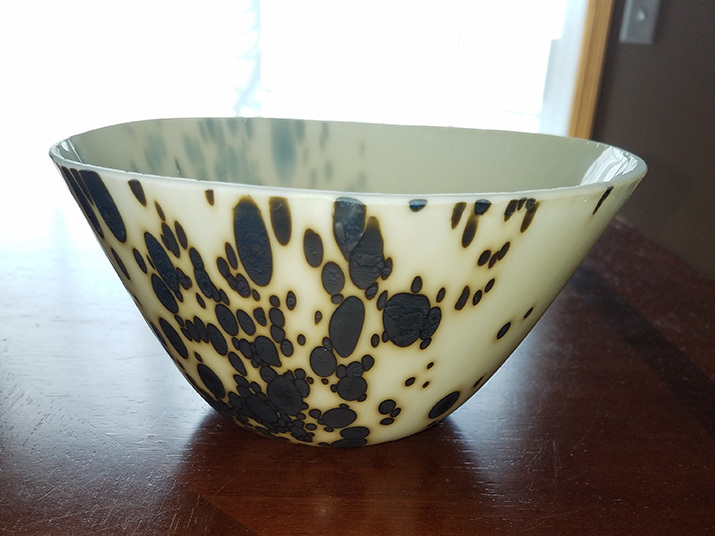 Check out more of Allison and Jonathan's work online, and be sure to stop by their booth and demonstration at the Minneapolis Gift & Art Expo, November 3-5, 2017 at the Minneapolis Convention Center! L'Donna Jewelry is the work of Susan Plunkett, born of her love for vintage jewels and all things sparkly. She began designing jewelry as a way to honor her mother by re-imagining her vintage costume jewelry as modern statement necklaces and earrings. It became clear that this was more than just a hobby when friends and family asked for their own family heirlooms to be transformed by Susan's creativity. Each gorgeous piece brings memories of the past, and we love this special way of keeping loved ones close. My name is Susan Plunkett; I am a jewelry artist, as well as a wife and mother. I design jewelry because I have always been drawn to beauty and to anything that sparkles with life. Vintage jewelry pieces, semi-precious stones, pearls, and crystals inspire me. Each designed piece is unique and special. I have been designing most of my life. As a young girl, I played with my mother's 1950's costume jewelry. I designed doll clothes and embellished each outfit with jewelry. After many years in medical sales, I left my busy career to raise two daughters. Jewelry designing began as a hobby. Using my deceased mother's costume jewelry, I designed bracelets and earrings for my sisters. Soon it grew to designing for friends and other family members. The hobby became a business. What do customers love most about your product? Customers love custom work designed with their family heirlooms. They will bring to me "old family" pieces (usually sitting in a box somewhere). Together, we look at them and discuss what the client would wear style-wise in a new piece. We may pick out semi-precious stones or pearls, or they will leave it up to me. At times it can be challenging trying to use these treasures, or the piece may simply come together. It is a joy to bring the past forward; it feels like a full circle moment connecting family from the past to the present. There are no words that can fully describe the feeling when a client sees their new piece and they love it! The first piece of jewelry I made (besides macaroni necklaces in grade school) was a bracelet made from vintage beads. The beads were from a necklace of my mothers'. I added crystals to make an interesting design. My mother, Donna, passed in 1983 from breast cancer at the age of 55. In fact, the name of my company is from both my parents names. The "L' stands for my dad, Lyle. And of course, Donna was my mother's name. Every time I write the company name, L'donna Jewelry, I think of them. There is so much beauty here; the blue water, green vegetation, beautiful sunrises and sunsets, how can it not be a part of your art? I find that as I blend colors of stones and pearls that it usually mimics some part of nature. Also, as I travel to different parts of the country or abroad, I find beautiful vintage pieces that reflect that area. It is so much fun to bring a memory of an area alive in a piece of jewelry by adding semi-precious stones, pearls, and crystals to the vintage piece. One of my favorite things about my career and attending shows is meeting new clients. It is so interesting to show them my designs, tell them the story of the piece, and why I designed it the way I did. Most pieces have a name and often times the name will touch a chord with the client. The funny thing is I believe that the client and the jewelry piece find each other. And quite often, a new acquaintance will become a long time friend. Check out more of Susan's work online, and be sure to stop by her booth at the Minneapolis Gift & Art Expo, November 3-5, 2017 at the Minneapolis Convention Center! Cameron C-Weir uses his background in fine woodworking for a special niche; he creates beautiful bows and arrows. Grey Goose Bows are not only stunning works of art... they are functional, too. Cameron began crafting bows and arrows for a social club, but it quickly turned into a business after friends and family requested one of their own. We admire Cameron's enthusiasm for his craft, and his work is truly one-of-a-kind. I’ve been working on my own twist on Horse bows. it’s a prototype that I call the Koramturk. It’s a hybrid between a Korean and Turkish recurve bow. The Big difference I use bamboo for the belly as opposed to Horn. I make little longbows that shoot kabab skewers I call them the Longbow Nano. They’re quite cute and great stocking stuffers. You can use them in a game called table top archery. I needed a bow for a club I was in called the Society for Creative Anachronism and enough of my friends saw them, wanted one themselves and now I’m here. I’ve always had an entrepreneurial mindset and generations of artistic skill/genetics in my family. I’m an 8th generation woodworker. Well, handmade bows or objects of any sort have a unique style to the maker, though sometimes those features are more apparent or deliberate than others. In my case, the prominent feature of my bows Is no straight lines and more importantly no hard edges. It is a deliberate design trait in my bows. I enjoy making living wood. I think it is one way to honor the tree(s) that comes from. Also seeing the giggles and faces of folks who get the bows for themselves or loved ones. Well, there is always a lot, especially for folks just starting out. So, I guess one of the big ones is learning how to network, i.e. find other makers/artists or occupations that can help you run your business and bring in clientele. This process sounds way easier than it is, but once you get a critical mass of connections and a reputation as dependable it becomes a lot easier. Check out more of Cameron's work online, and be sure to stop by his booth at the Minneapolis Gift & Art Expo, November 3-5, 2017 at the Minneapolis Convention Center! Artist Emily Lavalier has demonstrated that she has no limit to her creativity; each beautiful and intricate composition is made using found imagery and materials. Her "high density collages" are bright and detailed, and we love the abstract affect that she achieves through layers of paper, paint, and other objects. Her works are an ode to the Twin Cities lifestyle, from skylines to craft beer to nature. We are inspired by her passion for creating... we hope you are, too! My name is Emily Lavalier and I am a high density collage artist from Minneapolis, Minnesota. I started doing this type of collage about five years ago, and didn't start calling it "High Density collage" until Park Point Art Festival in Duluth Minnesota in 2016. One of the jurors referred to it as "High Density" and it has stuck. Each original is made up of thousands of pieces of paper layered on top of each other creating a very three-dimensional final product. I use recycled magazines and Goodwill children's books, as well as string, beads and paint- making this collage unique in it's style and dimensionality. I graduated from the University of Wisconsin-Madison with a communications major- thinking that maybe I had a future in magazine layout and production. My mother had wanted me to attend art school, but to compromise I decided that I'd do the UW but take art classes on the side. My junior year my capstone project for my Drawing Two class was due around the same time as all of my final papers- and I spent hours upon hours working on that capstone project. I was laying on the floor of my shared apartment with my art supplies surrounding me- not even thinking about my other classwork. I should have realized at that point where my passion was- but it took me another six years to finally decide that if I invested in a future in art it could potentially pay off. I also worked about ten other jobs and realized the only way I could stay focused and planted for long periods of time was if I was doing something I loved and cared a lot about. My artwork is that thing. Yes! I was an aspiring artist from a very young age. Through most of my schooling I wanted to be an animator- before everything turned to computer generated drawings. My senior year in high school I created elaborate sculptures for my friends out of clay that I gifted as graduation presents. While I was working full-time jobs through my early professional life I would spend most nights working on greeting cards and wedding cards for my friends- they all agreed I should try to sell them, but at that point I preferred making them for fun. "The amount of time I spend on each one I would have to charge $40.00 a card!" This all changed when I started making the "cards" much larger and putting them behind glass. What's your favorite item that you sell? The World Map I have created out of animals cut from old books and magazines is my favorite work at this point. I spent over two years working on the map- adding animals over time- taking me about 200 hours to finish. Since I've gotten it framed and hanging I can stare at it for hours- and Steve, at Fast Frame, who does most of my framing told me he thinks that piece is "magical." I have made archival prints of the map as well as poster prints and placemats- these are my favorite items. I also am a fan of my Chicago World's Fair poster- a cut paper reproduction of the Century of Progress World's Fair in Chicago in 1933. The original is beautiful framed with a black and white double matte, but the prints also turned out beautifully and are probably my biggest seller. Paper-cutting is definitely a growing medium- I follow many different Instagram and Facebook accounts of other paper-cutters around the world. The reason I love paper-cutting is that you really can never find an artist doing the same style of work. Every paper artist has their own eye, look and style, using various papers and other embellishments. Some artists map there work using computer programs, and others make their own papers to cut apart. My work is unique in that it is completely freestyle. I never know what the final piece is going to look like until it's finished- and there are often whole sections I'll work on- and then end up covering up with more paper later on. This freestyle method leads to a very textured finished product, added to with the addition of beads and string. My work is also very detailed, giving viewers the opportunity to look at each piece time and time again and constantly see something new- a detail or two they hadn't noticed prior. I'm from Minneapolis and live here now- this city is a huge inspiration for me. Minneapolis is a very forward thinking city, one that allows entrepreneurs the opportunity to try new things. I think my artwork is appreciated for its uniqueness because of this. Travel has also been an inspiration for me. I worked as a travel agent for four years after graduating from college and have had the opportunity to visit over thirty countries on four different continents. Being a solo traveler for most of it gave me the courage to take the step into making art a full-time passion as well as meeting many new and diverse people. I still work full time in group homes for folks with developmental disabilities and my day-to-day work gives me inspiration to truly follow my passion. My hope is to use my artwork to someday fix the disability system in America, and going to work every day leaves me motivated to go home and create. Lastly, I have been inspired by the creativity of Walt Disney and the detailed work of paper cutters Derek Gores and Nathan Stromberg. Check out more of Emily's amazing work online, and be sure to stop by her booth at the Minneapolis Gift & Art Expo, November 3-5, 2017 at the Minneapolis Convention Center! We are excited to welcome Earth, Wick & Fire to the Gift & Art Expo! Julie Beal and Ed Vidmar create beautiful candles from natural stone, and we love that they will last for years to come. Read more about these unique creations, and be sure to visit their booth at the expo! Earth, Wick & Fire is a small, family based business located in Excelsior, Minnesota. Our hand crafted stone oil candles are made out of natural slate that varies in beautiful mineral colors and textures. During the creation of each candle the characteristics and design are controlled by the composition of the slate and the artist, no two candles are ever alike. Earth, Wick & Fire has created a maintenance free, low profile candle that you will enjoy for years, just add oil. Our fiberglass wicks do not burn away and each copper wick holder is hand crafted. The reservoir holds 1 oz. of lamp oil and will burn for approximately 4 hour before putting itself out. The addition of essential oils to the reservoir will add a wonderful aroma to your space. Citronella oil may be used outdoors. The creation of our double heart and Minnesota shaped candles are our new feature this year. Check out more of Julie and Ed's beautiful work online, and be sure to stop by their booth at the Minneapolis Gift & Art Expo, November 3-5, 2017 at the Minneapolis Convention Center! 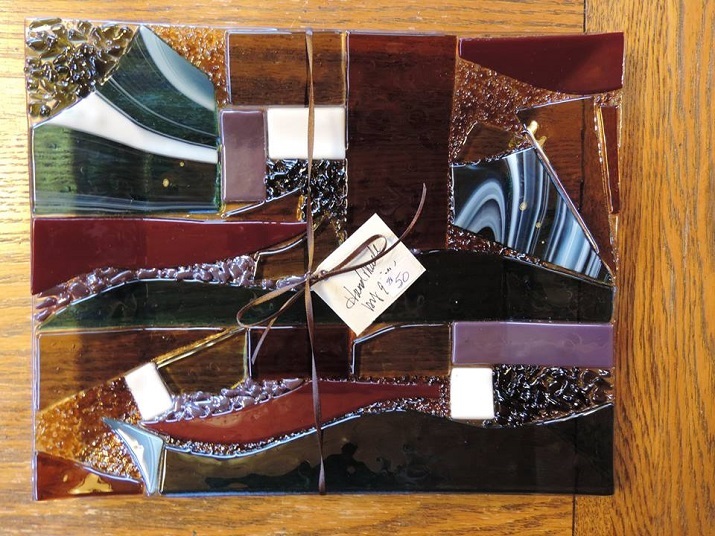 Elisa Schaum is a fused glass artist who is inspired by diffused light; the beautiful colors and shapes in her pieces are elevated by the light that passes through them. Her reverence to the art form started with one simple beginner class, and since then she has continued to challenge herself with new techniques. Elisa's passion truly shines through in each of her beautiful, functional objects. My name is Elisa Schaum and I fuse glass in a kiln. It’s a process where I take 2 more pieces of fusible glass and melt them together in a glass kiln. The piece is then slumped into the shape I’m trying to create- like a plate or bowl. Drop out molds! This is where the glass piece “drops through” a ring mold to make a deeper vessel bowl. 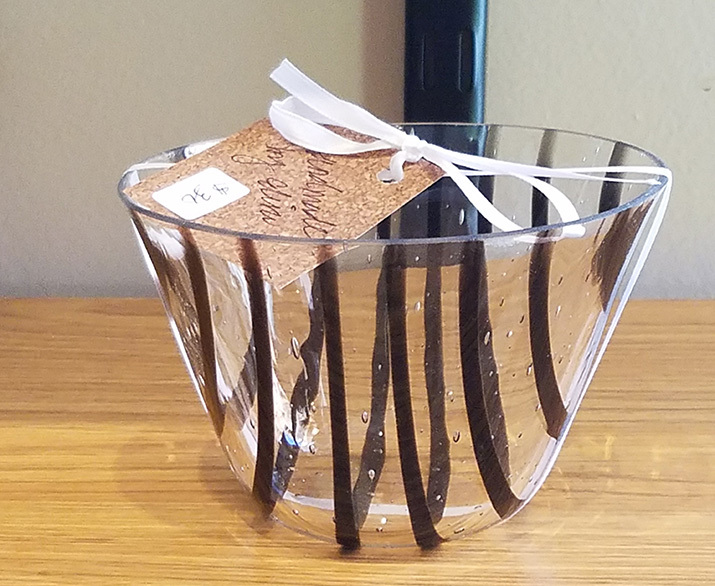 It’s a more challenging design to accomplish not only in getting the piece to melt just right but also not crack when I remove the glass rim off the bowl. I took my first class at a community education class and made a plate. From there I was hooked in the beauty of melting glass together to make an object. A year later I started taking professional classes and built my own studio so I could do this year round. They are unique and one of a kind creations. Fused glass isn’t that common so they don’t see many pieces like what I create. It's definitely something new for a home that no one has. Is this a full time business for you? No, I have a full time job so I work in my studio on the weekends and do a handful of shows a year. Why did you start working in the particular craft? Because I loved how I can take different glasses or metals and melt them together for the effects. When reflective light transmits through glass, it takes my breath away. Check out more of Elisa's beautiful work online, and be sure to stop by her booth at the Minneapolis Gift & Art Expo, November 3-5, 2017 at the Minneapolis Convention Center!